Introduction: Tuberculosis (TB) is one of the endemic diseases with a challenging diagnosis in the absence of pulmonary disease. On the other hand, rheumatoid arthritis (RA) is a systemic autoimmune disease with extra-articular manifestations that occur at any age after onset, such as nodules, Sjögren’s syndrome, anemia of chronic disease, and pulmonary manifestations, which are more frequently seen in patients with severe, active disease. Here we present a case of RA with intestinal TB. 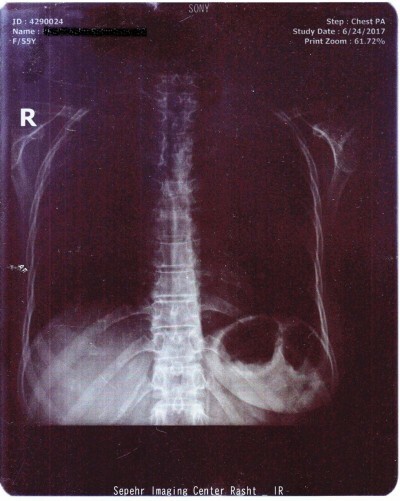 Case report: A 55-year-old woman with a 30-year history of RA using prednisolone and hydroxychloroquine presented with a nonpositional hypogastric pain and a weight loss of 20 kg over 7 months. No history of biological therapy was recorded. Colonoscopy revealed an ulcerated mass that was suspicious for malignancy. The pathobiological assessments confirmed ulceration and granulation tissue formation, foci of necrotizing granulomatous inflammation in lamina propria with adjacent mild crypt regenerative changes. Also, Ziehl–Neelsen staining for acid-fast bacilli in the granulomas was positive though the polymerase chain reaction assay did not detect the Mycobacterium tuberculosis. Anti-TB medication for 2 weeks eliminated the symptoms. Conclusions: Intestinal TB in patients with vague abdominal symptoms and relevant physical findings such as pain and palpable mass should be considered to prevent late or misdiagnosis.